Order your Boss RC505 Loop Station from AMS and enjoy 0% Interest Payment Plans, Free Shipping, Free Extended Warranty & 45 Day Money Back Guarantee. 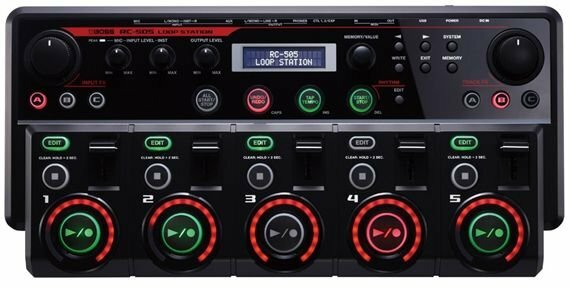 Advanced looping possibilities for all types of musicians is now availble with the Boss RC505 loop station. . In a compact tabletop device, you have easy fingertip control of five stereo phrase tracks and various loop playback behaviors, plus INPUT FX and TRACK FX that deliver a wide range of real-time processing options for dynamic, expressive sound creation. Just plug in a mic, instrument, or other audio source, and then ride the intuitive panel controls to build and mix some amazing loops! The RC505 also supports computer integration via USB and operation with external pedals and MIDI. 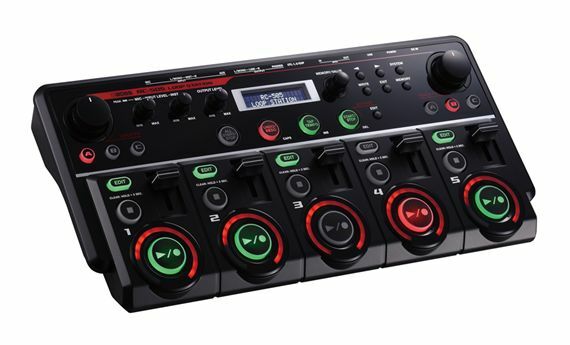 The RC505 is perfect for beatboxers, singers, and club performers who want a unique and powerful live performance tool. The RC505 features five stereo phrase tracks that can play simultaneously, the most yet in a Boss Loop Station. Independent record/overdub/play and stop buttons for each track let you capture and control loop performances with your fingertips, and dedicated volume faders allow you to mix loop levels on the fly. Each track can have its own playback mode (multi, single, one-shot, reverse, etc.) and tempo sync settings, providing an unlimited range of creative looping behaviors. With the large selection of built-in effects, it's easy to enhance your sounds as you perform. INPUT FX such as ROBOT and VOCODER create unique, dramatic sound textures for recording loops, while TRACK FX like VINYL FLICK and BEAT REPEAT provide dynamic DJ and sampler effects for real-time processing of phrase playback. Six dedicated buttons-three each for INPUT FX and TRACK FX-can be loaded with your favorite effects, giving you one-touch on/off access while looping. In addition, effects parameters (filter cutoff, effect depth, etc.) can be tweaked in real time with the INPUT FX and TRACK FX knobs. Global compressor and reverb effects are also available for processing the overall sound output. The RC505 is outfitted with a number of simultaneous inputs, allowing you to capture and mix a variety of different audio sources as you build loops. There's an XLR microphone jack with phantom power, mono/stereo A 1/4 inch inputs for guitars, synths, or other instruments, and an AUX mini-jack for connecting a music player, smart phone, or other stereo devices. I had been waiting months to finally make the purchase and it’s worth it 100% ???? It is one hundred on a scale of one to a hundred. It is fire, well worth the money. Been dreaming of this hardware since it came out. Loving how easy it is to make loops and tracks. Thanks to AMS for making it possible for me to purchase with their awesome payment options. clean sounds good, a lot to learn but it can do a lot.. I guess the title says it all. This is an inspiring piece of music equipment. It makes the task of building ideas so much easier and quicker. Building loops is easy, and so is storing them. The sound is great, and I love many of the effects, and the beats are great too. Guitarists please don't overlook this looper. I thought this was NOT the looper for me since I am a guitarist so I went with the RC300....that was the wrong choice. I exchanged it for the RC505 and am not looking back. The RC300 is like a tank and good for the road and gigging but if you are a studio artist like me you should get the RC505. You won't be sorry. Five tracks makes a huge difference. Also you can use an FS-6 footswitch to allow engaging the device by foot. I have been doing fine without it though....awesome! Luv it. Super easy to use. If you are looking for a musical experience that you have once only dreamed about, then this is the product for you. This product will have you go from a amateur creator to a Pro with the push of a button. Get this product and unleash your inner talents, I dare you! Easy to use, easy set up and a nice a clean look. I’m just starting out and this is perfect for me. It helps me explore my sound.